Ten days or so ago, my Mum came back from shopping with a bag of passionfruit. 'I thought you could do something interesting with them', she said. And so the search for 'something interesting' to do with them started. 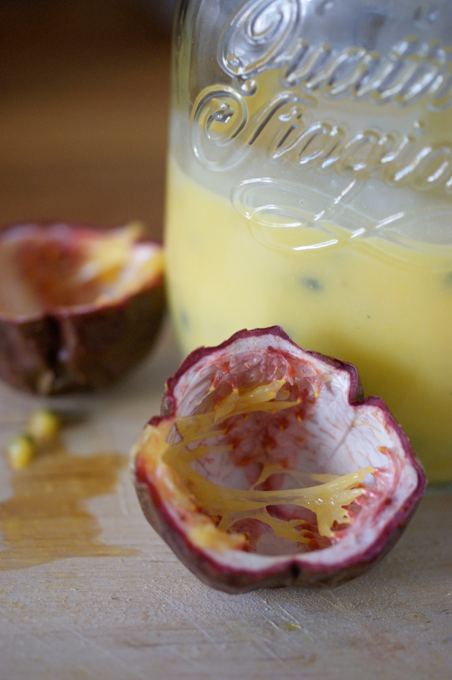 I found several recipes for passionfruit curd and in the end my curiosity won out and I started making it. Once I had made it, I couldn't decide what to do with my lovely curd. 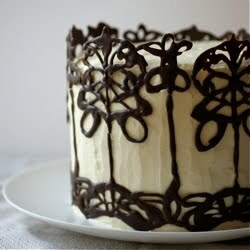 I very nearly had a go at this cake, made by the lovely Chele at Chocolate Teapot. 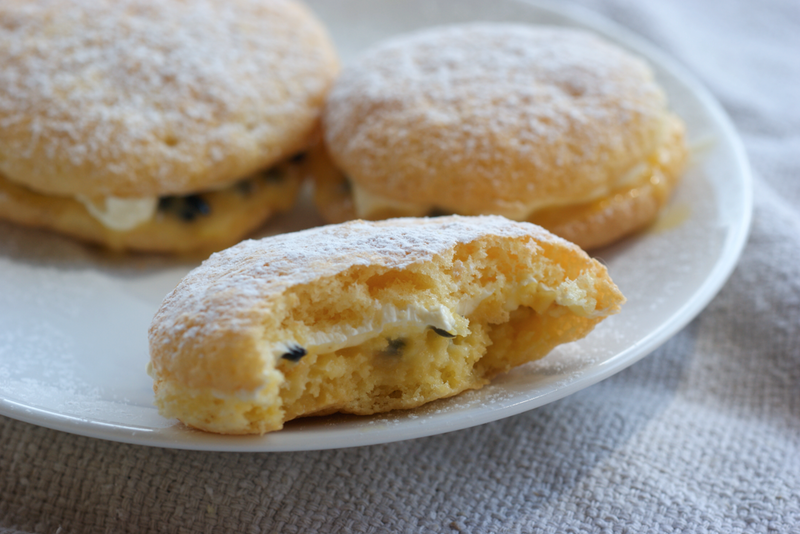 Then I wanted to somehow make mini victoria sponges and fill those. Then I thought I could make little tarts with it. Meanwhile, I kept eating it with a spoon from the jar, waiting for inspiration to hit. In the end, the lightbulb went on when Mum came in from the balcony with the latest issue of Delicious magazine and requested I make her the sponge drops with strawberry curd and chantilly cream that she had found. It seemed like the perfect showcase for the curd. 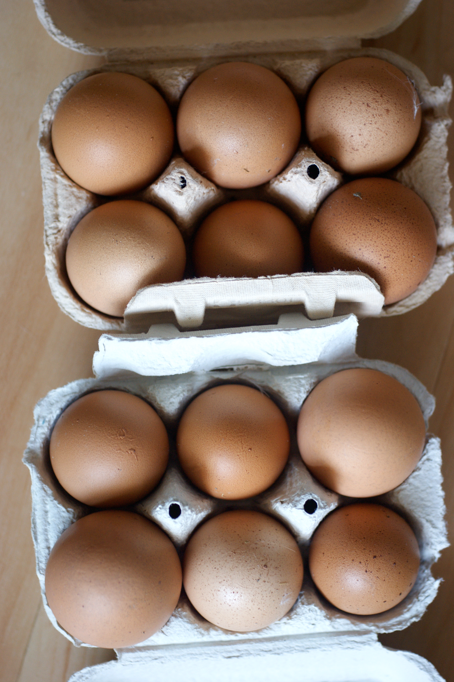 On Sunday we came home from the market in town with a bounty of beautiful fresh farm eggs. With a fatless sponge like this, the quality of the eggs really shone through. I decided to use mascarpone accented with lemon rather than chantilly cream, as I thought it would be neater and complement the curd. The original recipe used fresh sliced strawberries as well, but I didn't have any more passionfruit and didn't want to overpower the curd. I made them up as we wanted them - they go soggy fairly quickly. I found that the non-sandwiched halves went quite soft the next day so I popped them in the toaster and they perked up. They weren't as soft in the middle as before, but the slight crunch went well with the soft filling. 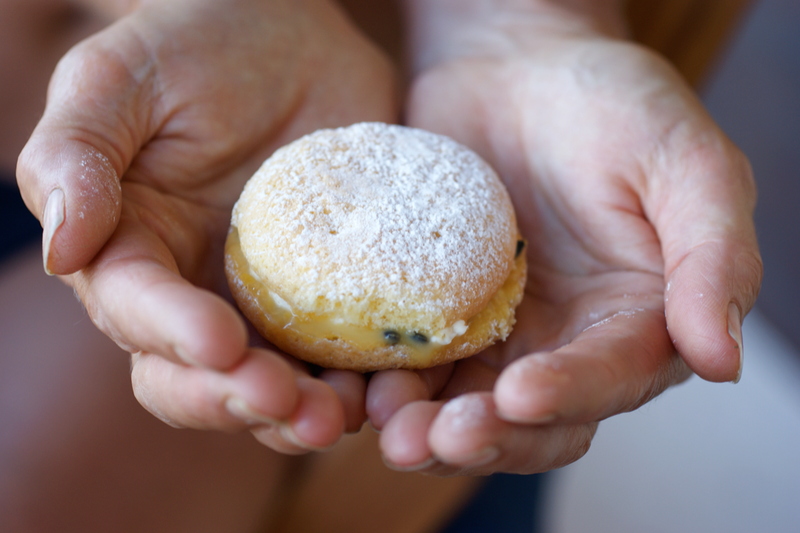 I'm so pleased that Mum pointed me to this recipe - these sponge drops are infinitely adaptable - just think of the different curds, creams, ganaches etc you could sandwich them with, let alone flavouring the cake! They're not the prettiest cakes in the box, but they taste amazing. The sponge drops are crisp on the edges, incredibly light and soft in the middle. 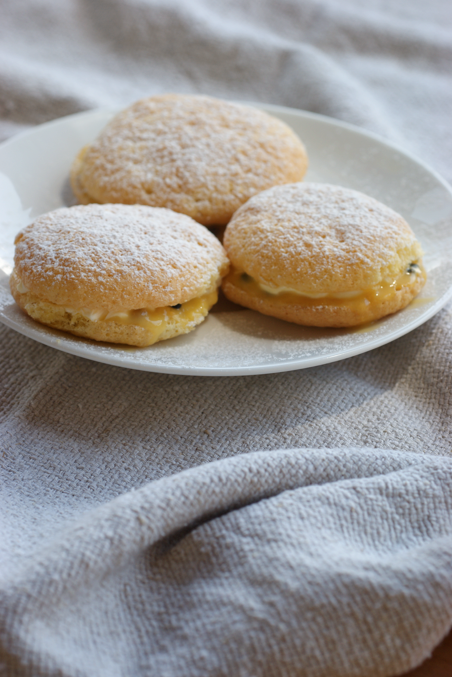 The heavenly, buttery, solid-sunshine passionfruit curd and a touch of creamy mascarpone pull the two drops together into a lovely harmony. Preheat the oven to 170C/330F. Line 2 baking sheets. Put the eggs, sugar and vanilla into a mixer and whisk on medium until trebled in volume and very pale and thick. This takes about 7 minutes. It should fall in ribbons upon the surface. Sift the flour and baking powder over the top. Use a large metal spoon to gently fold the flour into the mixture. Take fairly exact tablespoons of the mixture and drop onto the lined baking sheets, leaving a 3-4 cm gap between them. Bake for 8 to 10 minutes until golden and crisp. Let cool on the sheet then peel off the paper. Scrape the passionfruit out into a small metal bowl. Add the eggs, yolk and sugar and whisk to combine. Place over a saucepan of simmering water. Keep whisking until the mixture begins to thicken - around ten minutes. It should coat the back of a wooden spoon. Once is has reached this consistency, remove from the heat and stir in the cold butter until it is fully melted. Allow to cool then keep in a sterilized jar. It will keep in the fridge for about 2 weeks. Beat together the mascarpone and lemon juice. Pair up the sponge drops into similar shapes/sizes. On one half of each pair, spread a thin layer of the mascarpone mix. On the other halves, spread liberally with the passionfruit curd. Place the mascarpone half on top of the curd half. Dust with icing sugar and serve. This looks like a simple recipe to make and looks really delicious!! I've never seen these sponge drops before!! Must've been really good with the passionfruit! It was very tasty !!!!! I am going to have to ask my mum to make them. These look amazing. Anything with passionfruit is delicious. I think you could eat it on tree bark and it would be lovely. I think I'll try the sponge drops instead, though. 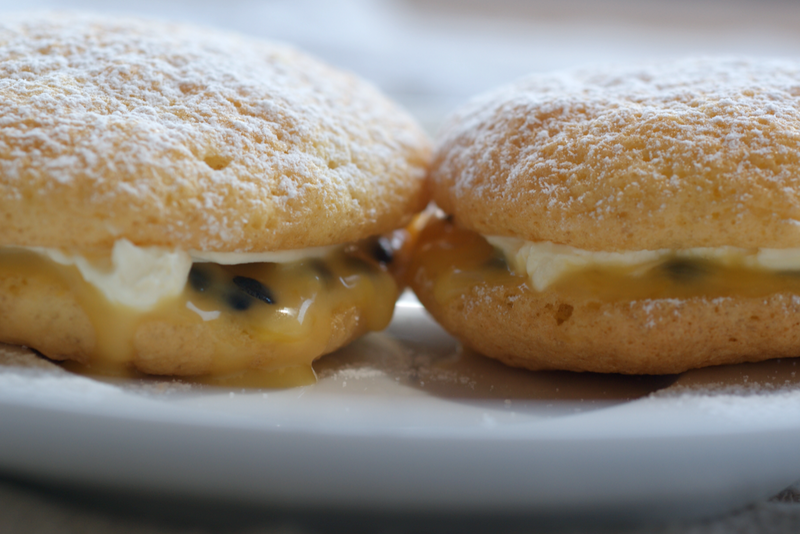 What a wonderful way to use passionfruit curd! I'm like you and eat it straight fromt he jar so I'm lucky if I ever have any left o bake with lol. I love passionfruit and sponge cakes, so this sounds like a perfect recipe for me. Passionfruit are so expensive here, but worth the splurge. very easy, and tasty. i stacked them into a dessert with vanilla cream with meringue tops. How would one store these?